The origins of this house in Sheep Street have not yet been discovered, but in 1781 a plaque was fixed to the outside wall by John Ellis, a threadmaker and Senior Burgess of the town. He and his wife, Angel, had no children and the house with the business passed to his nephew, Francis, in about 1802. The plaque has now disappeared but this drawing was found in a book of local architecture. In the early 1800’s Francis supplied flax to the nearby workhouse, presumably for the pauper inmates to convert into thread, and there may have been a cottage industry locally in threadmaking. We know from Francis’s will that he left money and other property to his two younger sons and two daughters when he died in 1820 but the house and workshops passed to his eldest son, John, who was listed in the 1841 census as a farmer with 12 acres. Subsequently he divided the house into three dwellings, one occupied by him and his wife, and converted the workshops into two cottages, and was shown as a ‘proprietor’ in the 1851 census. 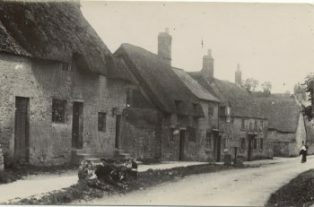 In the early 1900s the building (at the far end of the row) looked like one house but was sub-divided inside. These five dwellings continued to be occupied until the 1960s when the building was converted back into a single house. Further study will concentrate on the threadmaking business and its links with the making of rope and twine in Campden.